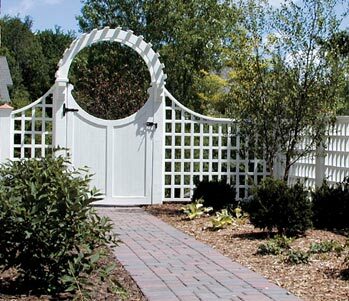 Outdoor Designs will work with you to achieve a balance between practicality and beauty. Our fences and gates are custom designed to match the style of the property they inhabit, as well as provide added security and privacy. The homeowner chose this extravagant 42 inch wide Malibu arbor with a unique half circle gate to offset the easy and straightforward lines of our 48 inch Grid fence.